Meeting of New Year in Tatarstan is usually begun at 11 o'clock evenings. 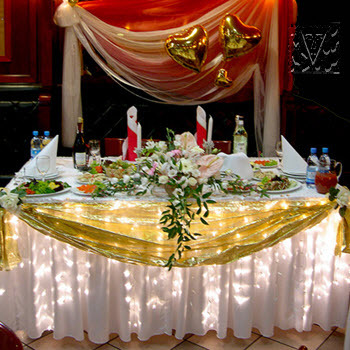 On a festive new-year table put different salads, cold snacks, jellied, fried fish, fruit (tangerines, oranges, apples), salt cabbage, tomatoes, wheat and rye bread, mineral waters, juices and champagne. A new-year table usually is not large: on 8-12 persons. Therefore cold snacks put in one general dish. Soups do not give to the new-year table. However hot dishes give two times - to New Year, usually, fish dishes and after stew or fried meat (mutton, veal or beef) with a potato on garnish; meat dumplings, pilau, stuffed goose or hen, ochpochmaks, peremech et cetera. In the end give tea or coffee. With tea put sugar, jams, candies, with coffee sugar, hot milk or creams. Sweet baleshes add to the tea-table, also cakes, kosh-tele et cetera.